The Obama administration has an implementation problem. More than any administration of the modern era they know how to talk but have trouble doing. They give speeches about ObamaCare but when it’s unveiled what the public sees is a Potemkin village designed by the noted architect Rube Goldberg. They speak ringingly about the case for action in Syria but can’t build support in the U.S. foreign-policy community, in Congress, among the public. Recovery summer is always next summer. They have trouble implementing. Which, of course, is the most boring but crucial part of governing. It’s not enough to talk, you must perform. That gets us to the real story of last week, this week and the future, the one beyond the shutdown, the one that normal people are both fully aware of and fully understand, and that is the utter and catastrophic debut of ObamaCare. Even for those who expected problems, and that would be everyone who follows government, it has been a shock. They had 3½ years to set it up! They knew exactly when it would be unveiled, on Oct. 1, 2013. On that date, they knew, millions could be expected to go online to see if they benefit. What they got was the administration’s version of Project ORCA, the Romney campaign’s computerized voter-turnout system that crashed with such flair on Election Day. Here is why the rollout is so damaging to ObamaCare: because everyone in America knows we spent four years arguing about the law, that it sucked all the oxygen from the room, that it commanded all focus, that it blocked out other opportunities and initiatives, and that it caused so many searing arguments—mandatory contraceptive and abortifacient coverage for religious organizations that oppose those things, fears about the sharing of private medical information, fears of rising costs and lost coverage. Throughout the struggle the American people must have thought: “OK, at the end it’s gotta be worth it, it’s got to give me at least some benefits to justify all this drama.” And at the end they tried to log in, register and see their options, and found one big, frustrating, chaotic mess. As if for four years we all just wasted our time. A quick summary of what didn’t work. Those who went on federal and state exchanges reported malfunctions during login, constant error messages, inability to create new accounts, frozen screens, confusing instructions, endless wait times, help lines that put people on hold and then cut them off, lost passwords and user names. After the administration floated the fiction that the problems were due to heavy usage, the Journal tracked down insurance and technology experts who said the real problems were inadequate coding and flaws in the architecture of the system. There were no enrollments in Delaware in three days. North Carolina got one enrollee. In Kansas ObamaCare was unable to report a single enrollment. A senior Louisiana state official told me zero people enrolled the first day, eight the second. The founder of McAfee slammed the system’s lack of security on Fox Business Network, calling it a hacker’s happiest nocturnal fantasy. He predicted millions of identity thefts. 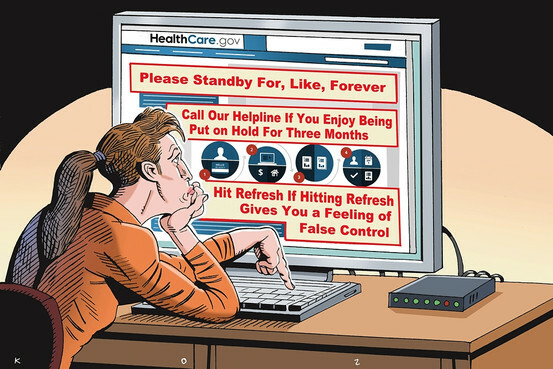 Health and Human Services Secretary Kathleen Sebelius—grilled, surprisingly, on “The Daily Show”—sounded like a blithering idiot as she failed to justify why, in the middle of the chaos, individuals cannot be granted a one-year delay, just as businesses have been. More ominously, many of those who got into the system complained of sticker shock—high premiums, high deductibles. Where does this leave us? Congressional Republicans and the White House may soon begin a series of conversations centering on the debt-ceiling fight. Good: May they turn into negotiations. Republicans are now talking about a grand bargain involving entitlement spending, perhaps tax issues. But they would make a mistake in dropping ObamaCare as an issue. A few weeks ago they mistakenly demanded defunding—a move to please their base. They will be tempted to abandon even the word ObamaCare now, but this is exactly when they should keep, as the center of their message and their intent, not defunding ObamaCare but delaying it. Do they really want to turn abrupt focus to elusive Medicare cuts just when it has become obvious to the American people that parts of ObamaCare (like the ability to enroll!) are unworkable? The Republicans should press harder than ever to delay ObamaCare—to kick it back, allow the administration at least to create functioning websites, and improve what can be improved. In the past the president has vowed he’d never delay. But that was before the system so famously flopped when people tried to enroll. A delay would be an opportunity for the president to show he knows what’s happening on the ground, a chance for him to be responsive. It would allow him to say the program itself is good but the technological infrastructure, frankly, has not yet succeeded. This would allow him to look like one thing no one thinks he is, which is modest. A closing thought on the oft-repeated liberal argument that ObamaCare must stay untouched and go forward as written. They say it was passed by Congress, adjudicated by the courts and implicitly endorsed in the 2012 election; its opponents are dead-enders who refuse to accept settled outcomes. There was always something wrong at the heart of this argument, and it’s connected, believe it or not, to a story involving Johnny Carson. His show was a great American institution. When Carson retired in 1992, David Letterman was assumed to be his heir. Instead, NBC chose Jay Leno. In time Mr,. Leno faltered, and NBC came back to Mr. Letterman, who now was receiving more lucrative offers from the other networks. Everybody wanted him. But it was his long-held dream to host “The Tonight Show,” and he anguished. Then, as Bill Carter reported in “The Late Shift,” his advisers came to him. “The Tonight Show” starring Johnny Carson doesn’t exist anymore, they said. It’s gone. It’s Jay Leno’s show now. If you want to take a lesser deal to be his successor, go ahead. But the old “Tonight Show” is gone. This helped clarify Mr. Letterman’s mind. He went with CBS. OK, the Affordable Care Act doesn’t exist anymore. It was passed and adjudicated, but since then it has changed, and something new taken its place. Hundreds of waivers and exceptions have been granted. The president decided he had the power to delay the participation of businesses, while insisting on the continued participation of individuals. The program debuted and the debut was a disaster and Americans who want to be part of it haven’t been able to join. The ACA doesn’t exist anymore. It isn’t the poor piece of legislation it was, it’s a new and different poor piece of legislation. All of this is highly unusual. A continuation of unusual would therefore not be out of order. Delay the program. It’s a mess and an oppression. Improve it.